To understand why there's so much manipulation taking place in the "world of finance," it would help to know just what IS the "world of finance." At one time, Barclays even had a corporate slogan: "Quietly conquering the world of finance." So, I guess they know. 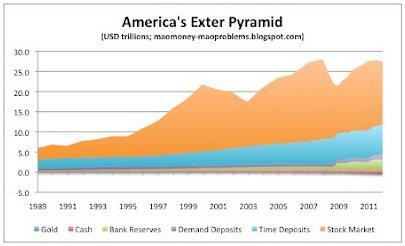 One illustration that some folks use to explain this financial world is Exter's Pyramid. However, I'd like to show you that it's only a small piece of the "world of finance." Exter is known for creating Exter's Pyramid (also known as Exter's Golden Pyramid and Exter's Inverted Pyramid) for visualizing the organization of asset classes in terms of risk and size. In Exter's scheme, gold forms the small base of most reliable value, and asset classes on progressively higher levels are more risky. 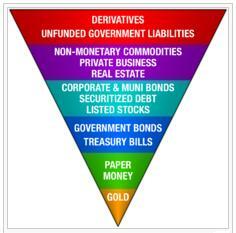 Exter's pyramid does show that in terms of risk, the further one gets away from gold, the more risk they take on. Exter's not about to just give you the complete picture of the world of finance, because whether this has been said or not, a central banker's last obligation is to tell the public the truth. With Exter's inverted pyramid, he's not lyin', but not telling the whole truth. Kind of like lyin' by omission. It should be obvious that Exter's inverted pyramid is not free-standing in nature. No pyramid stands on it's point. Even if Exter tries to make a point. 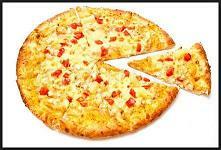 One side of Exter's pyramid is simply a triangle, like a slice removed from a pizza. Rotate the inverted pyramid in your mind so that a complete circle is formed. This is now a similar view as if you had sliced our earth and its atmosphere in half. 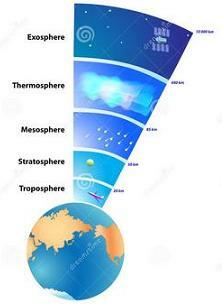 Below, notice that there are five levels of atmosphere just as there are five levels of finance in Exter's pyramid shown above. those different levels could look like these below. The above information was featured in a Zero Hedge commentary here. Please note that this commentary didn't even try to represent trillions in derivatives. However, that is not the "world of finance" either. Our world is not flat, and neither is the "world of finance." So take one more step. In your mind, rotate the "pizza" into a sphere. Now you can visualize the "world of finance" with gold (and silver) at its core or center, and the different levels of risk completely circling that core. The further away from the core, each level of finance is much larger than the previous level and also entails higher risk. Think of the "world of finance" as somewhat similar to the physical world in which we live, with earth as its core, and everything else above the ground as its atmosphere. The difference is that our atmosphere was made by nature, and all levels above the golden core are man-made promises that are currently expanding every day. 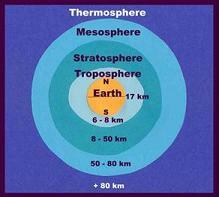 The higher you go in our atmosphere, the higher your risk of surviving if you should fall. Same with the "world of finance." Promises are as flighty and weighless as gases. No matter how you travel through the layers of finance, promises are most often only exchanged for other promises. Only when promises are exchanged for gold (or silver) are you on "solid" ground. NOTE: Yes, I know there are other precious metals, but let's keep this simple. With Exter's inverted pyramid rotated, you can see that the "world of finance" becomes a sphere with a golden core, with distinct levels above it just like our earth and its levels of atmosphere. That gives new meaning to these phrases; "high-flying securities," "blue-sky ventures," and "launching new securities." I'm sure you can name some examples yourself. Everything above the gold (and silver) core are nothing more than promises. The only solid point is the metallic core, which has no counterparty. Everything else are promises created from almost nothing, and those promises can disappear into the void almost effortlessly. 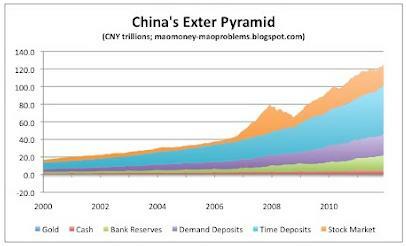 Don't forget, it was John Exter, a central banker, that pointed this out in the first place by bringing forth Exter's Pyramid. Which is exactly why those who profit from manipulating promises hate gold. To profit from your exertions, they must convince you to trade your physical labor and objects for paper promises, and the further away from gold the better. Therefore, extreme manipulation of all financial markets, especially gold and silver, is the only way certain entities can continue to pilfer wealth from citizens of the world without direct physical confrontation. Unfortunately, when these financial sociopaths get really desperate, violence also takes place.